It’s not every day that a ten year old girl introduces you to her dancing robot. That doesn’t faze Jasmine Parekh, a bubbly middle-schooler from New Jersey. Eager to break into a field where most professionals are men older than her father, Jasmine has built a robot that dances in response to both audio and visual cues. It’s her first project, but Jasmine blithely hopes to tackle artificial intelligence sometime in the next year. “I want to make one that can talk to people and answer their questions,” she said, watching proudly as her creation shuffled across the table to top-40 hits. Jasmine was strutting her technological stuff at The New York Maker Faire, now in its third year at the New York Hall of Science in Queens. 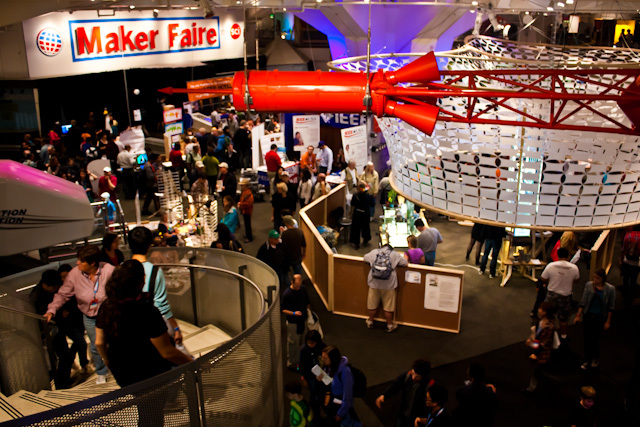 The Maker Faire is a haven for some of the most whimsical scientists and inventors in the world. Sherry Huss, director and “maker-in-chief” of the event, describes Maker Faire as “a county-fair-meets-science-fair-meets-farmer’s-market-meets-craft-fair.” That mouthful still isn’t enough to cover it, as she also calls the Maker Faire “Burning Man for families,” comparing it to the massive counterculture festival held each summer in the Nevada desert. While there’s been a maker faire in Northern California for a decade, Huss thinks that the New York spin-off attracts even more fascinating “makers”. And they’ve definitely got skills. Over the course of the faire, which took place on September 29 and 30 despite occasional rain and an epic shutdown of the Queens subway lines, one could see everything from 3-D printers to periodic table-themed bumper stickers. There was a kit that converts typewriters into keyboards, and even a flaming unicorn that shoots glitter from her nose. Her name is Katy Perry, and she can also urinate the beverage of your choice. Katy may not make kegs obsolete anytime soon, but the implementation of random –if not always good– ideas is what Maker Faire is all about. One thing (other than the flaming unicorns) that really sets the event apart is the abundance of young children registered as makers. Most of them, like Jasmine, make the trip with their teachers and mentors to show off their promising first attempts in science and technology. Jasmine’s teacher is David Peins, a former public school shop teacher who’s been teaching robotics on his own for the past two years through his tutoring program Robodyssey. He believes strongly in the power of robotics as a tool to reach students who are bored with more abstract learning. “They give what you’re learning a context,” he said. All photos were taken by Arielle Duhaime-Ross. I wanted to add to the mention of David Peins and Robodyssey. David has been working with my son and his group for sessions of 14 weeks each He is a wonderful teacher and passionate about motivating young kids in this field. 3 cheers to him and his efforts!!!! !